On the back of a very Mighty Leap, Corrado De Sio defeated (22) Martin Jůza in the finals and became the second champion of this triple Grand Prix weekend, the first to feature Amonkhet Limited! 1,669 players had joined Grand Prix Bologna to make this the biggest event of the triple Grand Prix weekend. After the first day's nine rounds, the field was cut down to 539, including (22) Martin Jůza at 9-0. For most of Sunday, Jůza had people wondering: Would he reach the 25th Grand Prix Top 8 of his career? Claim the fifth trophy? The Pro Tour Aether Revolt quarterfinalist did indeed make the playoffs and was joined there by a number of players who were no strangers to the feature match area either. 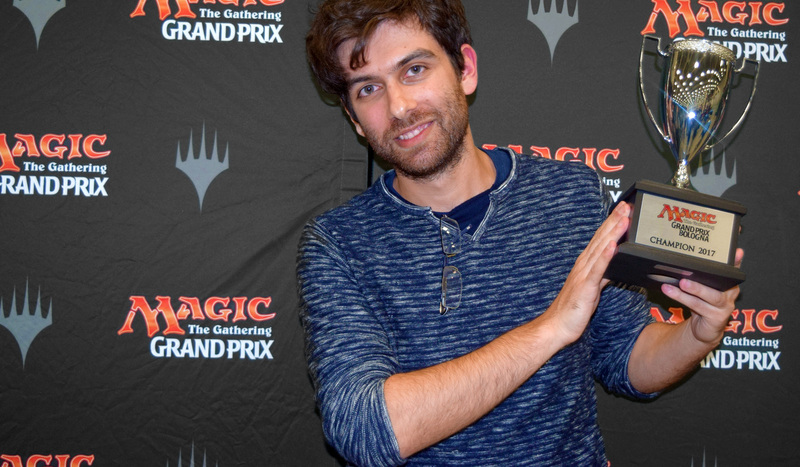 Francesco Giorgio, Pascal Vieren, and Simon Nielsen had previously finished third, second, and first at the World Magic Cup, respectively; now each of them as well as Dario Parazzoli added a second Grand Prix Top 8 to their résumé. And let's not forget Javier Dominguez who went to six and was fighting for a third trophy. In the end, however, it was Corrado De Sio who stared down Martin Jůza in the finals—and won with the help of a well-timed Mighty Leap. When asked for previous Magic accomplishments, De Sio had listed, "None." Now he could add the title of champion of Grand Prix Bologna 2017—a Mighty Leap indeed! After nine rounds of Amonkhet Sealed Deck play, Grand Prix Bologna's original field of 1,669 competitors was cut down to just 539. Leading the charge into the second day were Pro Tour Aether Revolt quarterfinalist (22) Martin Jůza, Grand Prix Kuala Lumpur 2014 champion Fabien Li, Grand Prix Madrid 2015 finalist Francesco Giorgio, Grand Prix Stuttgart quarterfinalist Patrizio Golia, Michael Meier, and Claudio Biscione. And other notable players like Christian Seibold, Javier Dominguez, Louis Deltour, Arne Huschenbeth, Pascal Vieren, and Sergiy Sushalskyy were, with at most one fewer win, not far behind. All of this suggested that the new set formed a great, skill-rewarding environment for Limited play, and the outlook for the second day and its Booster Draft rounds was sunny indeed! After all, this was Amonkhet, a world with two suns, one of which didn't set yet. Quite unlike the one in Italy. Which is to say, good night from Bologna! The hashtag for Grand Prix Bologna is #GPBol. Join the conversation!